The Power Chute Kite has more pull than a Super Kite and Skyhook combined. 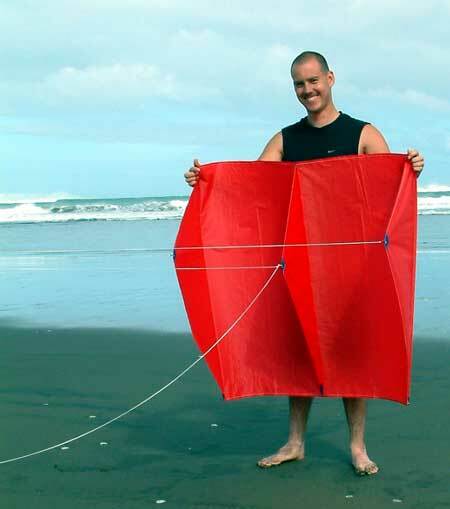 The Power Chute Kites are ideal low wind kites, and a valuable addition to any of the larger rigs. These kites will often provide real fishing pull in winds too light to even fly a delta kite let alone fish with one. 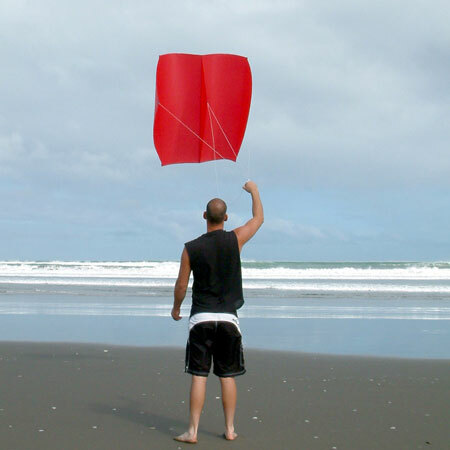 Its wide wind range also makes it an ideal beginners kite. The Power Chute is very easy to launch and stable in flight. This is a very powerful fishing kite which delivers constant pull over a wide performance range. Suitable for light to fresh winds! Don't be deceived by the smaller size of the Power Chute kite. These two celled kites have three keels and are very stable fliers that will provide a good level of constant pull in their wind ranges. The constant pull delivered by the power chute kite makes them ideal for 65kg dropper rigs. The mainline on the Dropper Rig will often be supported clear of the water for 800 metres or more when using 50 to 65 kg breaking strain nylon fishing line. When using 130lbs breaking strain Spectra as the main line on a Dropper Rig it will be supported clear of the water up to 1500 metres offshore with this kite. If you are using a Spectra mainline Paul's Fishing Kites strongly recommend the Paul's Fishing Kites winch. If you don't have a winch always use leather gloves for hauling Spectra lines. The huge pull of the Power Chute is the reason why so many kite fishers that use them have an electric winch. gear against strong rips or anytime you need additional pull. The main bridle is attached to the kite line via a 22kg safety trace. Should the kite go into the water for any reason this safety trace will snap and the kite is then hauled in easily by the recovery line attached to the center keel of the kite. The Power Chute kite is only suitable for the larger 50 - 65 kg Dropper Rigs and 65kg plus Bottom Longlines.